Estadio Municipal de Ipurúa is a multi-purpose stadium located in the northern Spanish city and municipality of Eibar. 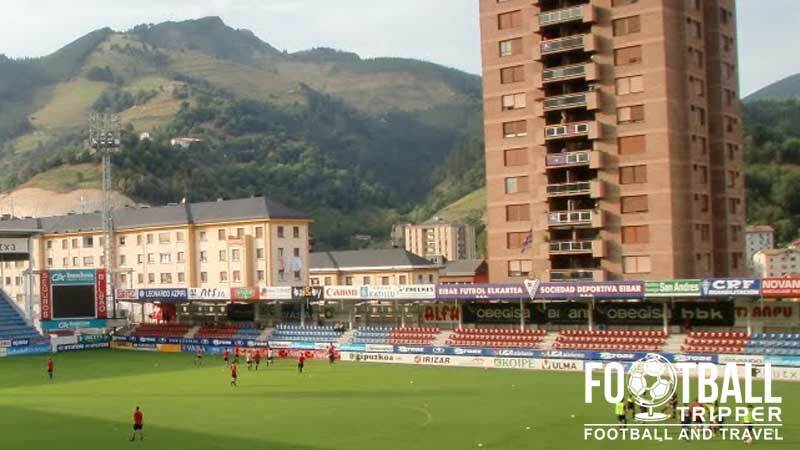 Home to local team SD Eibar since opening in 1947, the 5,250 capacity ground is primarily used for football matches with the most recent renovations occurring between 1998-2001. Ipurua Municipal Stadium first opened in 1947 when it was inaugurated on the 14th September with a friendly match against rivals CD Elgoibar who defeated the home side by two goals to nil. Consisting of a pitch and very rudimentary matchday facilitates, the first main stand took over three years to build and first opened in 1951. Situated at the bottom of a valley in a drainage basin that was prone to flooding, Eibar prioritised the mitigation of flood-risk by levelling the ground in 1959 and installing a basic drainage system. Money continued to be invested in ammenties rather than stands, and on 14th October 1970, the first floodlit match was played between Real Sociedad took on Athletic Bilbao. 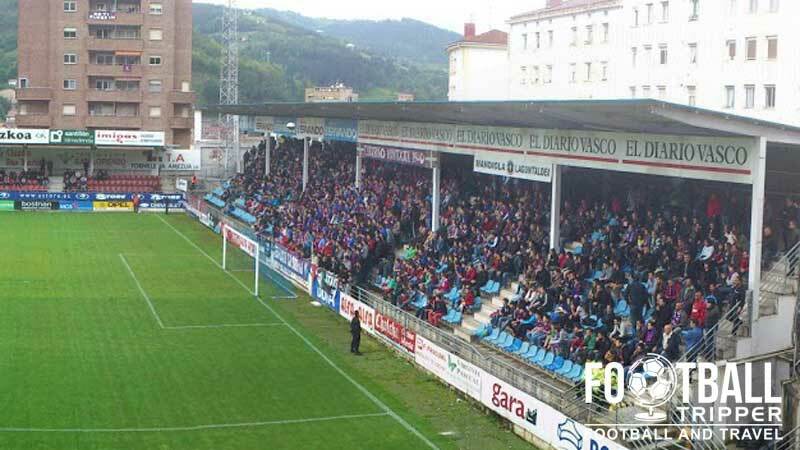 After gaining promotion to Segunda A in 1989 SD Eibar recognised that they desperately needed to improve the quality of the stadium but it wouldn’t be until 1998 almost eight years later that the club would receive funding from both the local council and Liga de Futbil Profesional in order to completely remodel the Ipurua. The renovation work saw the original main stand completely demolished and rebuilt as a full-length, fully-covered stand capable of seating 2,800. A year later both goal-end became fully covered and the terrace was largely replaced by rows of seating. Still battling ongoing concerns about flooding a new drainage system was installed. 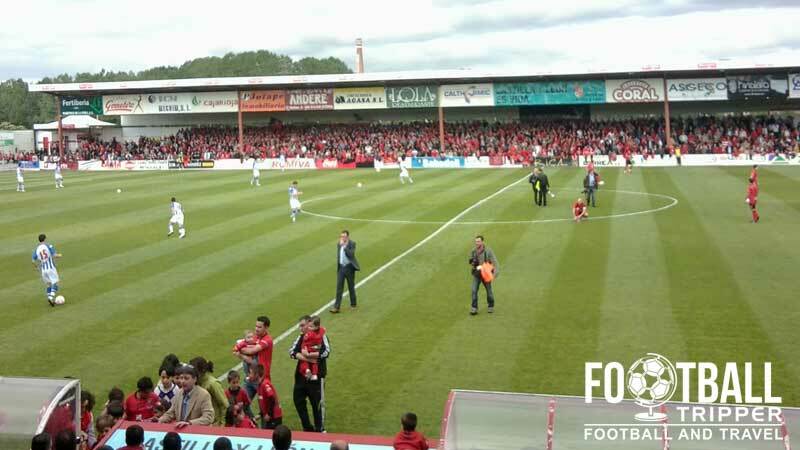 After being promoted to the La Liga in 2014 the club announced plans to expand the north stand which will increase the capacity of the ground to over 6,000. We can’t currently find a seating plan of SD Eibar’s Estadio Municipal de Ipurua. Apologies. Municipal de Ipurua consists of four stands which corresponds to the points of a compass: North, East, South and West. First formed in 1940, the 2014/2015 season represented the first time that the small side from the Basque Country would compete in the top flight of Spanish Football. Finishing two points ahead of Deportivo La Coruna, Eibar have spent 28 seasons in the Tercera Division, and almost a similar amount in the Segunda Division, it’s almost impossible to state how much of a fairytale story this is. Upon earning promotion to La Liga, Estadio Ipurua’s capacity was just 5,250 – not even half the size of the second smallest ground, Campo de Fútbol de Vallecas, which had a capacity of 14,708. Although not widely tipped to survive their inaugural season, if they do somehow avoid relegation it will be a minor miracle. Some of the most passionate Eibar fans proudly displaying their banners behind the goal. We’re not currently sure where the away fans are housed, if anyone knows feel free to tell us and we’ll update this section. Eibar is a compact little city with a population of just under 27,500. The map below outlines some of the more popular places to drink on matchdays, with the majority of them walkable within 20 minutes to Estadio Municipal de Ipurua. There are a number of restaurants located just two minutes north of the ground along Isasi Kalea and Untzaga Plaza which form two of the main roads of Eibar’s city centre. There are essentially three places to purchase souvenirs and gifts of SD Eibar: At the Ipurua stadium itself on matchdays, online from the official tienda or from the Intersport Askasibar shop within the city centre. This is located on 13-15 Calle Fermín Calbetón, 20600 and is usually open between 9.30 to 1.00 pm and then from 4.30 pm – 8.00 pm. 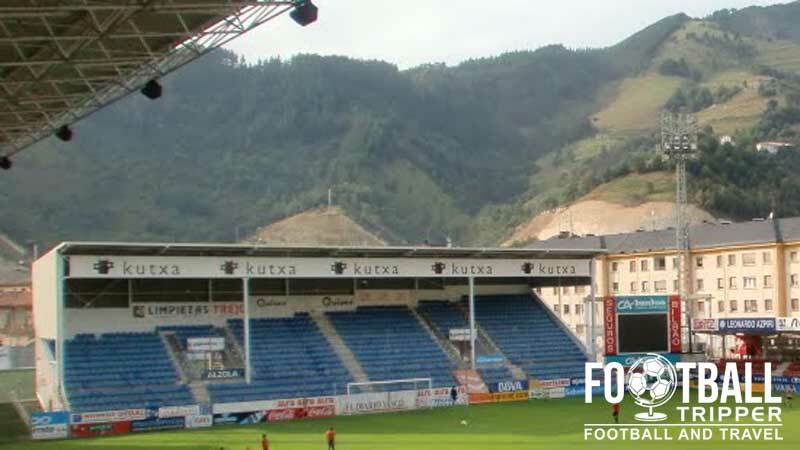 It doesn’t look as if SD Eibar currently offer fans the cance to undertake a stadium tour of Ipurua. If this changes after the renovation work which is set to be complete in the Summer of 2015, we’ll update this section. With a small capacity of less than 6,000 and the fact that it is the club’s first season in La Liga, tickets for the 2014/2015 are in very short supply. We can’t even access the information to find out how much they cost as they have already seemingly sold out for the entire season! Polideportivo Ipurua is literally 700m from Eibar city centre, and thus it is is eminently walkable from anywhere in the city which is hemmed in by mountainous terrain either side of it, north and south. Sign on the main stand which reads “Campo de futbol Ipurua – Futbul Zelaia”. There appears to be a medium-sized car cpark two minutes north west of the ground on Santaines Kalea but we’re unsure of the matchday arrangments. With no official on-site parking it looks like you will have to contend with street-parking. The city of Eibar is served by four train stations in total which span the length of its relatively narrow urban area. The main station is simply known as Eibar and is located approximately 1.5km north-west of Polideportivo Ipurua which will take you around 15 minutes to walk. The Ardantza station is technically closer located 700 metres north of SD Eibar’s stadium but in most cases it would be quicker to walk rather than get the train first. We’re currently unsure of any bus-routes but although we know that there is a dedicated stop at the back of the stadium, between the north and east stands called Ipurua. It appears to be served by the Db01 route which is run by Lurralde Bus. Bilbao’s airport is the closest International Airport at a distance of around 55km, with San Sebastian, one which is served by domestic flight carriers, approximately 70km away. The Hotel Unzaga Plaza nearby is the closest to the station at five minutes walk, with the Meka Hotel and Viajes Iberia being two back-up options. To be honest there isn’t much choice in the local area!